The flavours in this dish compliment each other wonderfully and it really can be made with any firm white fish such as Antarctic icefish or monkfish. Serve with a green salad and crusty bread. Preheat oven to 200C/400F/ gas 6. Place tomatoes, courgettes, garlic, olive oil and basil leaves in a shallow ovenproof dish. Season with salt and freshly ground black pepper. Place into the preheated oven and cook for 20mins. Whilst the vegetables are cooking, make the bread crust. Break the ciabatta into rough crumbs by rubbing between your hands. Mix with the prosciutto, pine kernels and a drizzle of olive oil. 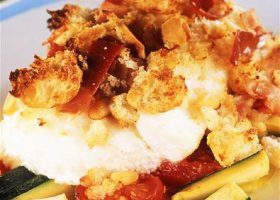 When the vegetables are tender, place fish on top and pile on the bread crust. Put in the oven and cook for 30-40 mins depending on the thickness of the fish. Serve immediately with a green salad and crusty bread.